Tim Belcher was a No. 1 overall draft pick who decided to go his own way. Only three people in the history of the Major League Baseball First-Year Player Draft have been selected No. 1 overall and then failed to come to terms with their team. The first was catcher Danny Goodwin, who spurned the Chicago White Sox in 1971 to attend Southern University and take his chances later on. Goodwin had a standout collegiate career at Southern, was selected No. 1 overall again in 1975 — this time by the California Angels — eventually played sparingly for three clubs in seven MLB seasons and was inducted into the National College Baseball Hall of Fame in 2011. The third was Brady Aiken, who left a reported $5 million on the table just a few weeks ago when talks between Aiken’s agent and the Houston Astros broke down before the signing deadline. It’s a twisting, complicated tale that involves medical reports, pool allotment money and, by now, a whole lot of bad blood. Here’s a thorough recap of how it all fell apart. But the second No. 1 overall draftee who went his own way — a 21-year-old pitcher from a small liberal arts college in Ohio — actually went on to have a decent MLB career. Over the course of 14 seasons, Tim Belcher won 146 games and a World Series title with the Dodgers in 1988 and compiled some 1,500 strikeouts in more than 2,400 big-league innings. 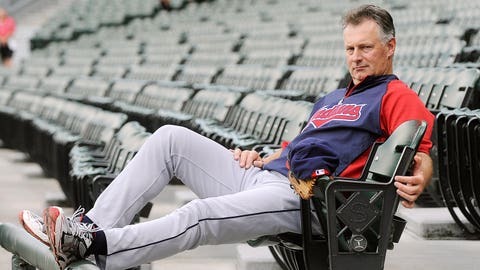 Most recently, he was a pitching coach for the Cleveland Indians during the 2010 and 2011 seasons. He’s also the answer to two pieces of MLB trivia: Not only did Belcher start Game 1 of the 1988 World Series, ended (of course) by Kirk Gibson’s dramatic home run, but seven years later, he gave up Derek Jeter’s first career hit. Now 52 and a special assistant in the Indians’ organization, Belcher spoke with FOXSports.com earlier this week while on the road in Ohio. He reflected on his own experiences as a No. 1 overall pick who made some unwanted history, whether he thinks that negatively affected his own pro career and what advice he might have for young Brady Aiken, who has now pushed him one notch down in the record books. Belcher is the third subject of our 5 For Friday series that has included Leo Mazzone and Warren Cromartie. 1. MALINOWSKI: You were the second player ever drafted No. 1 overall who then did not sign with that team. Did you have any understanding or appreciation for how rare it was for that to happen? BELCHER: I did not, no. Until the day it actually happened that I knew I wasn’t going to sign, I didn’t need to know it was a big deal, you know? I just felt like I was a victim of some circumstances that didn’t allow me to sign with the club. You know, that was a time when the Twins were at the end of the Calvin Griffith ownership period and they had no money. And not only did they not sign me, they didn’t sign Billy Swift, who was their No. 2 pick. He pitched in the big leagues a while. And Oddibe McDowell, who became an outfielder with the Rangers. They didn’t sign him, and we were three of their picks. They just didn’t have any money. So it was a little different situation than what you see currently. And there were a lot different numbers. Relatively speaking, they were vastly different. … The expected going rate for the first pick (for me) was just a touch over six figures, $100,000 or $125,000. The Twins were nowhere near offering that. The one downside, looking back on it, had I signed, was that the following year or maybe ’85, they had a bunch of rookies on the 25-man roster. It was a very, very high number, one that you never hear of. That was just a couple years after I was drafted, so I quite likely would’ve been one of them. 2. MALINOWSKI: The condensed version of what happened is that the Twins basically low-balled you — though they were also not a team with a bright future, either — and you brought in Scott Boras, and the two sides couldn’t come to an agreement. You entered the winter draft, which does not exist anymore, and the Yankees selected you No. 1. You were then chosen as a compensation pick by the A’s a few days later. Three years later, the A’s traded you to the Dodgers as a player to be named later from a previous trade. You made your debut in September 1987 when you were 25. That’s quite a circuitous route for someone who was once drafted No. 1 overall. How do you look back on that whole experience and how it evolved? BELCHER: You know, I didn’t give it a whole lot of thought because I was a kid who came from a background that didn’t lend itself to a guy who was going to jettison himself to the big leagues real quick. I didn’t pitch in high school. I wasn’t highly recruited out of high school. I ended up going to a small NAIA school in Ohio and didn’t pitch a whole lot of innings in three years. So the route that it took me to get to the big leagues kinda matched what my pedigree was at that point, to be honest with you. 3. MALINOWSKI: You were in the A’s minor league system for three years but made your MLB debut with the Dodgers three days after the A’s traded you to Los Angeles. You went 12-6 the following year, then you helped beat the A’s in the World Series. How satisfying was that sequence of events? BELCHER: It was very satisfying. There was a lot of guys on the other roster that I had played with in the minor leagues coming up. In fact, I think in that World Series in ’88, counting me with the Dodgers — there were five or six guys on the Oakland roster — there were seven of us that a few years earlier were on a AA club in the Southern League. That was a pretty good AA club, as you can imagine. Stan Javier, Luis Polonia, Jose Canseco in the outfield. Terry Steinbach, Eric Plunk, myself, Todd Burns, a whole lot of big leaguers. My first start in the Series didn’t go so well, as you might know. I was the Game 1 starter, and thanks to Gibby’s home run off Eckersley in the ninth, no one remembers how bad I did. I tell people it was my worst big-league start from the biggest stage, but it was the best game I was ever a part of. I was a trainwreck, but to be a part of that game and witness one of the all-time great moments in World Series history, that was pretty cool. 4. MALINOWSKI: You ended up pitching some 2,400 big-league innings over a 14-year career, which is certainly much more than most players get to experience in their careers. But ultimately, do you feel like your career was negatively impacted by not initially signing with the Twins? With the 24-hour news cycle and all the social media and everybody knowing everything, I think the pressure’s going to come a lot harder and a lot faster for (Brady Aiken) than it did me. He’s not going to be able to slip through the cracks and go about his business and pitch a couple years in the minors and hopefully, for his sake, break into the big leagues and have a good career. BELCHER: No, I don’t think so, no. Had that happened today — and this is the one thing that would concern me a little bit about the Aiken kid and his emotional state going forward — with the 24-hour news cycle and all the social media and everybody knowing everything, I think the pressure’s going to come a lot harder and a lot faster for him than it did me. He’s not going to be able to slip through the cracks and go about his business and pitch a couple years in the minors and hopefully, for his sake, break into the big leagues and have a good career. It’s going to be talked about every day, all day, from the first time he puts on that pro uniform until he actually reaches the big leagues and has success. 5. MALINOWSKI: Aiken’s situation with the Astros is much more complicated than yours was with the Twins, but there are some similarities. He’s now in a state of limbo for the time being. What sort of advice would you give him, as someone who has gone through the same kind of emotions that he must be feeling? BELCHER: Boy, that’s a tough question because I don’t have a handle on his exact circumstance and his exact relationship and how it all fell apart with the club. I guess if I had to give him any piece of advice, it’d be: Don’t overthink the process of getting signed. Just get signed, and then go about your business and go play. That’s easy to say, but gosh, the amount of money he’s looking at versus the amount of money I was looking at in 1983 are polar opposites. I was six figures, and he’s talking about $5 million at least. It’s vastly different, I understand that, but having said that, everything still is relative in that the most important thing for a player is to be on the field and go play. So the quicker he can do that and get this behind him, the better off he’s going to be. It’s probably no fun for him right now, I’m sure of that. He’s really young, too. I was a college junior and almost 22 years old when I signed my first contract. Yeah, you’re still a kid when you’re 22, but there’s a big difference from 22 to 18. You’re all No. 1 in the eyes of Erik Malinowski, whom you can follow on Twitter at @erikmal and email at erik.malinowski@fox.com.